In law, the term bar has two principle meanings. 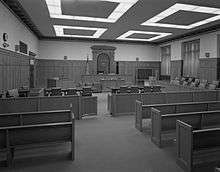 It may be a metonym which refers to the legal profession as an institution as well as the imagined line which separates the parts of a courtroom reserved for spectators and those reserved for participants in a trial such as lawyers. In the United Kingdom, the practice of law is divided between barristers (advocates in Scotland) and solicitors. It is usually the former who appear in an advocacy role before the court. When a lawyer becomes an advocate or barrister, he is called to the bar. ↑ Garner, Bryan, ed. (2004). Black's Law Dictionary, Eighth Ed. St. Paul, MN: West Publishing. pp. 157–8. ISBN 0-314-15199-0.